We offer our clients Signal Isolators. SCC401 is a 3-Port Signal Isolator that accepts any one of some common process inputs and generates an isolated current or voltage output. It is available in a 23 mm wide enclosure for DIN rail mounting. Standard input types include 0/4 - 20 mA, ohms, RTD and thermocouples amongst others. SCC401 has exceptionally high accuracy and stability.SCC401 provides isolation between its own power supply, the input and output signals up to 1.5 KV AC RMS per minute and 250V AC RMS continuously. The operator calibrates Zero & Span for the isolator via multi turn potentiometers. Input: 0/4 - 20 mA, ohms, RTD, Thermocouples, etc. SI4P is a Signal Isolator, that is used to prevent damage to valuable PLCs, DCS, etc. from fluctuations in the input signal from field devices. SI4P is factory-set to accept input from either of 8 types of thermocouples (B, E, J, K, N, R, S, T), Pt1000, Pt200 & Pt100 3-wire RTD sensors, DC voltage and DC current signals as well as resistance input. Special versions can also be ordered in sufficient order quantity for load-cell input. SI4P provides isolation between its own power supply, the input and output signals up to 1.5 KV AC RMS per minute and 250 VAC RMS continuously. The signal isolator is accurate to 0.1% of span and features line fault detection for alarms. The operator calibrates Zero and Span for the isolator via multi turn potentiometers through a detachable panel. The SI4P is mounted on a DIN rail in a control panel with 1LED to indicate it is operating. Relieved of a front display, it is a cost-effective solution. 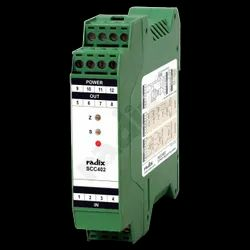 SCC311 is a Smart Signal Isolator utilized to prevent damage to valuable PLCs, DCS, etc. from fluctuations in the input signal from field devices. SCC311 is also a signal multiplier that retransmits 2 output signals from 1 input signal.It accepts input from 8 types of thermocouples (B, E, J, K, N, R, S, T), Pt100, Pt50 as well as Cu53 3-wire RTD sensors, 0 - 50 mV voltage and 4-20 mA or 0 - 20 mA analog current signals. 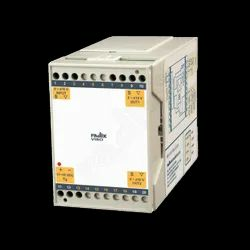 A cost-effective version for AC current/voltage input is also available. SCC311 provides isolation between its own power supply, the input and output signals up to 1KV AC RMS per minute and 250 V AC RMS continuously. The operator calibrates Zero and Span for the isolator on the front of the unit via membrane keys. SCC311 features a single programmable LED display to indicate the measured signal. 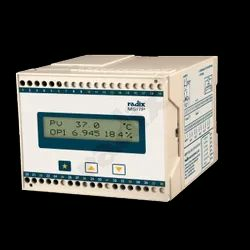 Radix can also provide a RS485/MODBUS RTU option for this isolator. Universal Input Signal Isolator, MSI7P, is a signal isolator utilized to prevent damage to valuable PLCs, DCS, etc. from fluctuations in the input signal from field devices. MSI7P is also a signal multiplier that can retransmit up to 5 output signals from 1 input signal.It receives input from 8 types of thermocouples (B, E, J, K, N, R, S, T), Pt100, Pt50 & Cu53 3-wire RTD sensors, 0 - 50 mV voltage & 0-20 mA or 4 - 20 mA linear inputs. Special versions for oxygen probes and oxygen lambda sensors are also available. MSI7P provides signal isolation of 1 KV AC RMS/1 minute and 250 V AC RMS/continuous between its own power supply, the input and output. The operator calibrates ZERO and SPAN for the isolator via membrane keys on the front of the unit. MSI7P features a single programmable LCD display, which indicates the type of thermocouple, process value, output signal and output signal percentage. Loop Powered Current Isolator, LPI51 provides signal isolation of 250 V AC RMS/continuous and 1500 V AC RMS/1 minute. LPI51 can be mounted on 35mm DIN rail in a control panel. It has an LED to indicate it is operating. LPI61 is 2-wire Loop-Powered Current Isolator which requires no external supply as it is powered by its input signal.LPI61 has a low loop-drop of only 3.7 V.
Isolators prevent damage to valuable PLCs DCS etc. from fluctuations in the input signal from field devices. LPI61 eliminates earth and ground loop problems by electrically isolating the input and output circuits. The signal isolator receives and retransmits a 4-20 mA current analog signal seamlessly with a transfer accuracy of 0.1%. LPI61 provides signal isolation of 1500 V AC RMS/ 1 minute and 250 V AC RMS/ continuous. LPI61 can be mounted on 35mm DIN rail in a control panel. It has an LED to indicate it is operating. Quality measurement and good equipment are very important parameter to achive Signal integrity. However, even with the best equipment, signals can be of inferior quality if the equipment is not properly installed or it is not protected by signal isolators / signal conditioners. 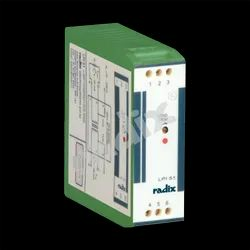 Radix design competency in Signal Isolator is one of the finest to be found. Radix signal isolators are an outstanding combination of accuracy, frequency response and signal handling. Choose from loop-powered isolators which require no external power supply and have very low loop drops, 3-port signal isolators which not only isolate input signals, but also act as signal multipliers and multiply signals to send to multple field instruments. Some of our signal isolators are HART compatible for effortless two-way field communication, that is achieved through superimposition of digital communication on top of the 4-20 mA signal. Signal isolation devices are use to eliminate ground loop errors caused by noise (ground) and other such signal interference problems. Signal isolators use one of many electronic methods to interrupt the connections between two grounds while passing the correct signal with little or no loss of accuracy. Without a way for ground currents to flow, these currents can't induce signal errors caused by ground noise. SCC301 is a dual purpose, current-to-current converter with 3-port isolation. It provides a fully floating, isolated DC supply for energising a conventional 2 or 3-wire 4~20mA transmitter/ smart transmitter and repeats the current in another isolated circuit or accepts a 4~20mA signal from a controller/source to drive loads up to 750 ohms. A 20~35VDC power supply is required for operation. The power supply terminations are at the top of the unit to enable this model to be used either as a repeater power supply or driver. For a 2-wire smart transmitter the unit also allows bi-directional transmission of digital communication signals superimposed on the 4~20mA signal so that the transmitter can be interrogated either from the operator station or by a handheld configurator. Input DC volts,0/4~20 mA,Ohms,RTD,Thermocouples,AC Amps,AC volts,load cell,etc. Input : DC volts, 0/4~20 mA, Ohms, RTD, Thermocouples, AC Amps, AC volts, load cell, etc. SCC301 is a dual purpose Repeater Power Supply/Isolating Driver, current-to-current converter with 3-port isolation. It is HART compatible; HART technology superimposes digital communication on top of the 4-20 mA signal for two-way field communication so that the transmitter can be interrogated either from the operator station or by a hand held configurator. 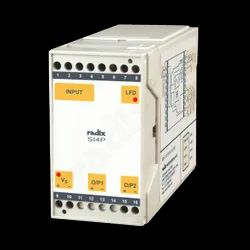 It provides a fully floating, isolated DC supply for energizing a conventional 2 or 3-wire 4-20 mA transmitter/smart transmitter and repeats the current in another isolated circuit or accepts a 4-20 mA signal from a controller/source to drive loads up to 750 W. A 20-35 V DC power supply is required for operation. 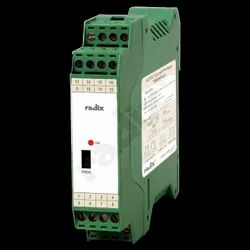 The power supply terminations are at the top of the unit, which enables this model to be used either as a repeater power supply or driver. SC301 provides galvanic isolation between its own power supply, the output and input signals up to 1.7 KV AC/DC continuously and has a transfer accuracy better than 20 μA. SC301’s micro controller technology linearizes the input which makes control more effective. 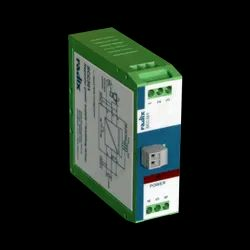 VISO is a DIN rail mounted signal isolator, for AC or DC signals up to ±10 V. It is an outstanding combination of accuracy, frequency response and signal handling. VISO is also a signal multiplier that retransmits 2 output signals from 1 input signal. Radix can also design VISO for 4 outputs on request. This isolator is available in an AC input type for frequency up to 1000 Hz and DC input type for frequency up to 5 Hz. VISO has an accuracy of typically 0.02% of span for DC and less than 5% of span for AC frequency above 250 Hz; it is much more accurate for lower frequencies (check data sheet for accuracy in your frequency range). VISO provides signal isolation of 1500 V AC RMS/1minute & 250 V AC RMS/continuous for its own power supply, the input and output. SCC313 is a signal isolator utilized to prevent damage to valuable DCS, PLCs, etc. from fluctuations in the input signal from field devices. It is also a signal multiplier that retransmits 2 output signals from 1 input signal. It accepts input from 8 types of thermocouples (B, E, J, K, N, R, S, T), Pt50, Pt100 as well as Cu53 3-wire RTD sensors, 0 - 50 mV voltage and 4-20 mA or 0 - 20 mA analog current signals. A cost-effective version for AC current/voltage input is also available.SCC313 provides isolation between its own power supply, the input and output signals up to 1.5 KV AC RMS per minute and 250 V AC RMS continuously. 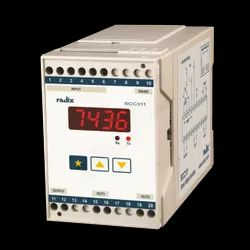 Radix can also provide a RS485/MODBUS RTU option for this isolator. The SCC313 Signal isolator is housed in a 100(H)x22.5(W)x114(D) enclosure and mounted on a 22.5 mm DIN rail. SCC402 is a 3-port signal isolator developed specifically to measure AC and DC voltage/current and generate a voltage output or isolated current. It is available in a 23mm snap-on enclosure for 35 mm DIN 46277 rail mounting. This isolator has exceptionally high accuracy and stability. SCC402 provides isolation between its own power supply, the input and output signals up to 1.5 KV AC RMS per minute and 250 V AC RMS continuously. The operator calibrates Zero and Span for the isolator via multiturn potentiometers. 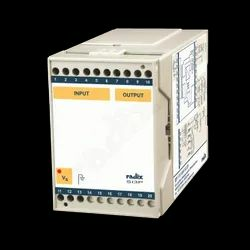 MSI7P is a Signal Isolator utilized to prevent damage to valuable PLCs, DCS, etc. from fluctuations in the input signal from field devices. MSI7P is also a signal multiplier that can retransmit up to 5 output signals from 1 input signal. It receives input from 8 types of thermocouples (B, E, J, K, N, R, S, T), Pt100, Pt50 as well as Cu53 3-wire RTD sensors, 0 - 50 mV voltage and 0-20 mA or 4 - 20 mA analog current signals. Special versions for oxygen probes and oxygen lambda sensors are also available. MSI7P provides isolation between its own power supply, the input and output signals up to 1 KV AC RMS per minute and 250V AC RMS continuously. The operator calibrates Zero and Span for the isolator on the front of the unit via membrane keys. MSI7P features a single programmable LCD display, which indicates the type of thermocouple, process value, output signal & output signal percentage. Looking for Signal Isolators ?